In July, a 12-year-old resident of Sandy, Utah, approached a postal worker and asked if he had any extra junk mail. Matthew Flores told mail carrier Ron Lynch that he loved reading, but there wasn’t anything to read around his house but ads—he couldn’t afford to take the bus to the library. Not every household has access to reading material or a nearby library. So in some communities, libraries have come up with a solution: mobile librarians who rove around town bringing kids books by bike. In Seattle, for instance, the Books on Bikes program includes 16 Seattle Public Library staffers and three different pedal-powered trailers customized to deliver books. People can sign up for library cards and learn more about downloading e-books to their mobile phones, and check out books and other media. The wagons have been bringing story time straight to kids’ (and their parents’) neighborhoods since 2013. 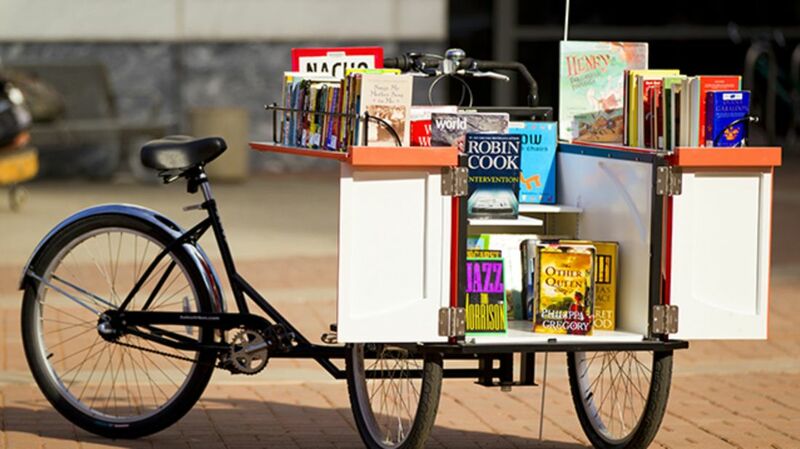 In Cleveland Heights, Ohio, the Book Bike began in 2013 as a way of giving out free books at events. However, the cargo tricycle now also carries circulating books to a nearby university, like a roving checkout desk. Books on Bikes programs bring story time events, free books, circulating materials, and more to cities across the country, from Charlottesville, Virginia to Pima County, Arizona. While some run year-round, they’re especially important in the summer months, because of something called the “summer slide”—the decrease in reading skills that kids experience after taking two months or more off from reading while they're out of school. The summer slide disproportionately affects low-income families, which is why it’s particularly important to implement reading programs in communities where there aren’t a lot of books and where kids may not have access to a library during the summer.